There's been a lot of hype surrounding cruciferous vegetables lately. But unlike most celebrities or sports teams, in this case the buzz is actually well-deserved. Research shows that cruciferous vegetables can help lower cholesterol, prevent certain types of cancer, counter inflammation, and detoxify the body. Wow, is right. It's actually quite an extensive family of vegetables, including broccoli, cabbage, bok choy, brussel sprouts, arugula, watercress, and collard greens. And if you were to look to the top of that list, you would find the star of today's recipe: Kale. Touted as a "wonderfood," kale is easily one of the healthiest vegetables you can eat. It's an outstanding source of dietary fiber, omega-3s, antioxidants, and bioflavonoids, and while packing a huge punch in terms of nutrition and health benefits, its calorie content is more like a half-hearted high-five. In the last 3 years, I've discovered not only how good kale is for you, but also how delicious and versatile it is as an ingredient. It's a staple on the menu at The Steeping Room and at the Daily Juice Cafe, two of my favorite places to eat out. Enjoying them prepared in so many ways, ranging from a quick saute, dried into 'crisps,' topping a pizza, or fed raw into the gaping maw of a juicer, I became inspired to integrate it into my home cooking. And while I've certainly enjoyed experimenting with different recipes and finding new, unexpected ways to sneak it into my diet, when it all boils down, I really like it best when it's prepared simply. 2. Thoroughly rinse/scrub vegetables. 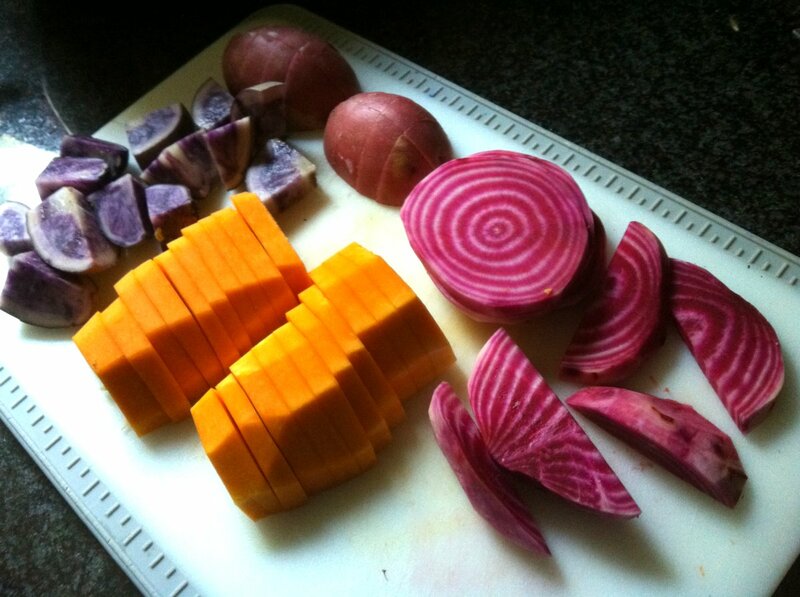 Peel squash and beet root and slice. 3. Dice potatoes into 3/4" pieces. 4. 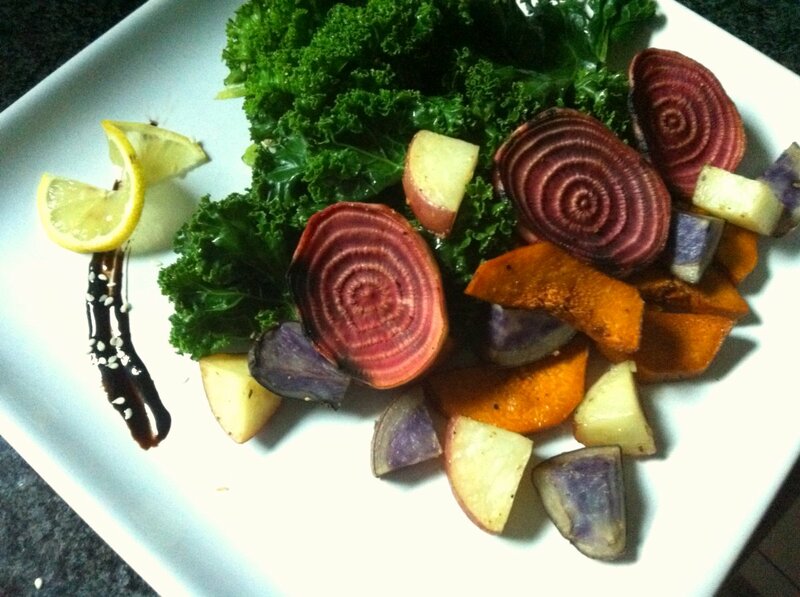 Toss butternut squash and beet slices with 1 tablespoon oil, balsamic vinegar, and agave. 5. 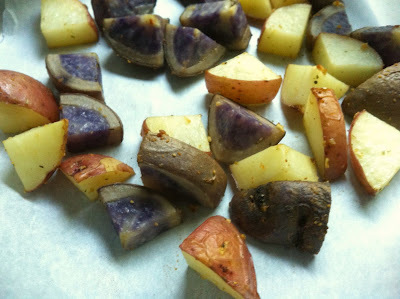 Toss potatoes with 1 tablespoon oil, garlic powder, and chipotle. Feel free to use more chipotle or even add a little cayenne for some added heat. 6. 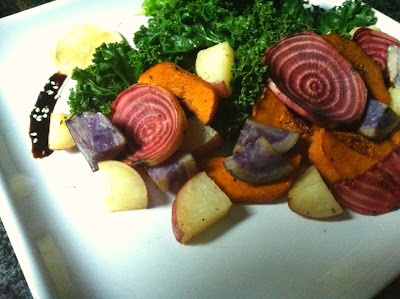 Roast vegetables for 30-40 minutes, or until they're fork-tender and starting to crisp on the edges. 7. While roasting, invert head of kale in a large bowl of cold water. Allow to sit for 5-10 minutes. 8. After soaking, cut or tear leaves into large, bite-sized pieces. 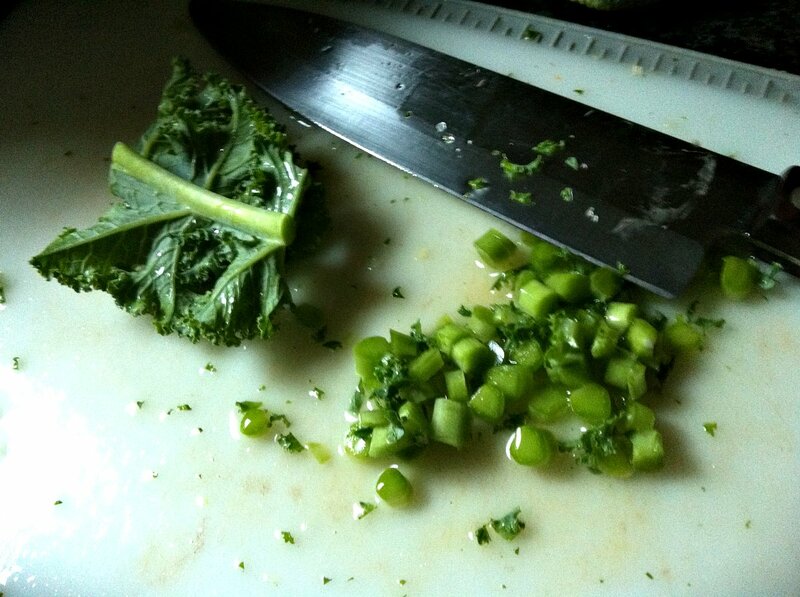 Chop stems into smaller pieces. Let prepped leaves and stems sit for 5-10 minutes (believe it or not, this step pays huge dividends in terms of kale's health-promoting properties). 9. When roasted vegetables are close to being finished, cover the bottom of a saucepan or wok with roughly 2" of warm water and bring to a gentle boil. 10. 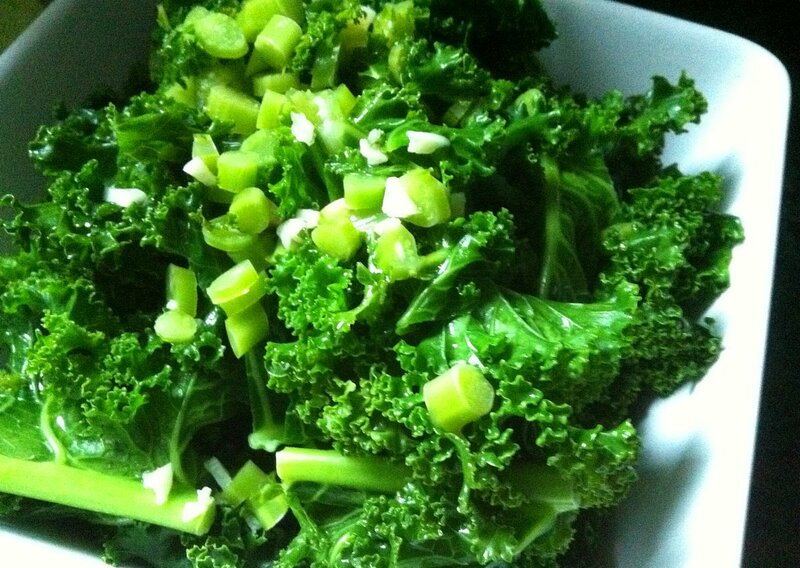 Fill steamer basket with kale and sliced garlic and cover. Allow to steam for 5 minutes. Depending on the 'fluffiness' of your kale and size of your steaming basket, you may need to repeat this step twice to cook all your kale. 11. When both kale and roasted vegetables are ready, plate with a sprinkling of sea salt, a squeeze of fresh lemon, and a drizzle of extra virgin olive oil. Serve warm. I absolutely love warm salads. And with this recipe in particular, I enjoy the interplay of sweet against savory, soft against crisp, and tangy versus smooth. So many wonderful juxtapositions to keep your tastebuds occupied and happy. While you could definitely serve this with a protein of choice or a side of rice or quinoa, I find that this salad is already a meal by itself. So much hearty chewing and quite filling. Other variations you might like to try with this recipe include garnishing it with thinly sliced jalapenos, roasting shallots with the beets and butternut squash (or whatever happens to be in season), or serving it with a balsamic reduction (as pictured above). Also, if this sounds like too much kitchen artillery (e.g., steaming basket, wok), there's no need to feel discouraged. While steaming kale is said to maximize its nutritional content, you could also parboil, braise, or saute it instead. The fact that you're cooking kale and enjoying it is really the point of this recipe. And I do hope that this recipe proves enjoyable, not only because of all the wonderful colors and flavors, but also because of what a service you are doing for your body and for those with whom you share it. So with that in mind, here's some food for thought. You are what you eat, and your body is a temple.